Jupiter, the largest planet in our galaxy, astrologically symbolizes the jovial inspiration of humor laced with endless deep thoughts about the universe. Jupiter encourages us to seek the fun factor, to look at the larger picture, and to see humor flowing from everything — all while looking through the eyes of love. It fosters easy access for a life imbued with one-liners and funny, sharp sarcasm. This attitude allows us to see ourselves from a distance and to look thorough rose-colored glasses, using the spiritual lens called the Observer, that allows everything to look so much better. If it were up to Jupiter, we would always be positive and would be willing to go for it. Few opportunities would ever be passed up. We would fearlessly plunge into any and all applications for a new job or take the courageous risks to find love again, while celebrating each breath like it’s your last. We would walk away from fears, allowing us to be bold enough to sing our hearts loudly without inhibition. We would spend money with no fear or concern for the future. With Jupiter in charge, joy would reign the stars — she knows that the universe has great abundance and can provide for all of us. Jupiter wants you to believe that your dreams mean something, and the more leaps of faith you take, the more you will grow and be rewarded. 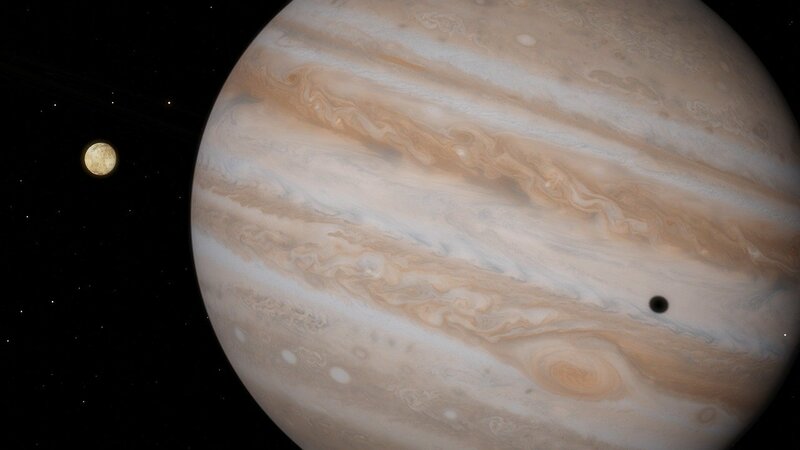 Visible in the night sky to the naked eye, Jupiter is brilliantly shiny. It is 300 hundred times the size of Earth and acts as a beacon of hope and optimism reminding us to lighten up. The heavenly arrangement that you were born under was no mistake. Look to Jupiter for clues on how to activate your joy, leading you beyond your limits and expanding your perspective. Jupiter wants us to combine all philosophies, religions, and ways of thinking to see the big picture of where we can find union. To achieve this, Jupiter sits right in the middle of our solar system, with Mercury, Venus, Earth, and Mars preceding it, and Saturn, Uranus, Neptune, and Pluto extending past it. This grand position of balance makes the energy stemming from Jupiter supportive of manifestation, and ideal for establishing justice and order. This celestial giant also rules Pisces — the greatest luck of all is to know that there are invisible forces who are watching you, holding you and praying with you. That is pure Pisces lingo, filled with faith and belief. Every twelve years, Jupiter comes home to the same position it was when you were born — also known as a Jupiter return. During this transit, you will experience a golden year, which expands far beyond just being lucky. You can predict when you will have it based on the 12-year rule, but you will want to study astrology to know when the exact time frame is, as it does not happen exactly 12 years to the day. How thankful are we that this benevolent and happy planet rules our galaxy as the biggest guy out there? Look on your chart and see where it lands to find where your joy is. Pay homage to Jupiter and watch the magic unfold. Debra Silverman believes that the quickest path to falling in love with your fate is through learning astrology. Join her in her online astrology program, Applied Astrology, where you’ll learn what your birth chart has to say about your mind, your purpose, and your destiny. Be the first to hear when registration opens again by visiting https://de192.isrefer.com/go/blogappliedastrology/blog/. Debra Silverman combines her love of astrology with her clinical background in therapy to help her clients fall in love with their fate and understand what they signed up for in this lifetime. In her online course, Applied Astrology, she will teach you the language of astrology while also inviting you to go deep into the lessons your own birth chart has to offer. Learn more about the course and put your name on the list to be one of the first to hear when registration opens again by visiting: https://de192.isrefer.com/go/blogappliedastrology/blog/. I so enjoy your videos… so upbeat and down to earth. Learning a lot from you. Thank you ?